Schedule – ATX CX Cup: Central Texas Premier CX Series. 2 Weekends. Many Races. One Big Party! 2018 Austin Cyclocross Cup Series latest news! Austin Cyclocross Cup Series latest news! In past years, we’ve been creative in ways to reward our Austin Cyclocross Series Category Champions, this year we are stepping up a notch. We worked with our good friends at Rocket Science Sports and designed a super cool champions jersey. It’s clean, classic and one you will want to frame, that is, if you are the CHAMPION! 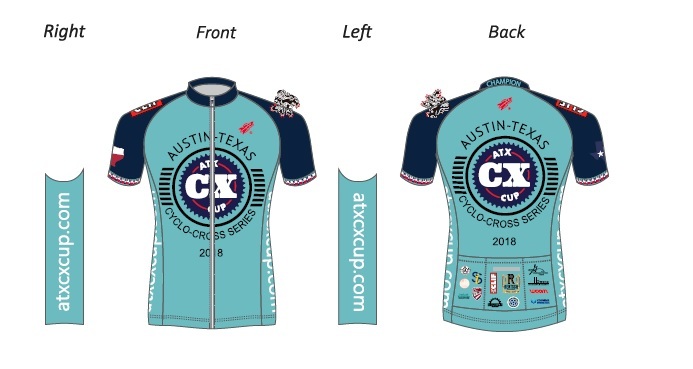 Austin Cyclocross Series Champions Jerseys will be awarded in categories. Finally, the early bird registration discount is available when you purchase the series discount pass. Take advantage and register early at www.bikereg.com/atxcxcupseriespass. Register from August 22nd – September 15th for $100. This is a $40 discount. Register from September 15th – October 11th for $120, this is a $20 discount. Second series pass will be discounted. All Kids/Juniors race for FREE as part of the scholarship program made possible by Woom Bikes, the award-winning children’s bike company and ClifKids. All events will have face painters on-site for kids (and some adults); ClifKids Pump Track at the Georgetown Cyclocross Festival (video). 2018 Georgetown Cyclocross Festival Presented by Rentsch Brewery. At our first stop of our series racers will be presented with the 250 ft. long sand pit which the beer garden will be strategically located near by. Also, for 2017, we will once again have the flyover! Date: Oct. 13th & 14th. Location: McMaster Athletic Complex in Georgetown, Texas 151 S Holly St, Georgetown, TX 78626. 2018 WurstCross Festival benefiting the New Braunfels Parks Foundation. Our second and final stop for the Austin Cyclocross Cup Series will be a two-day event (Sat. & Sun.)! Cypress Bend Park was a hit in 2016, we received great feedback and racers loved the course. Date: Nov. 10th & 11th. Discount will not be available after Oct. 11th. Individual discounted race entries are not transferable. Series Pass are not refundable! Questions or concerns, please reach us by completion the contact us form below. © Copyright 2019 by Austin Cyclocross Cup. All Rights Reserved.